Coal ash spills from a stormwater pipe into the Dan River. Groups across the country have worried about the dangers of coal ash for many years, but the threat really hit home for residents of the Southeast, and clean energy and clean water advocates nationwide, on December 22nd, 2008. On this cold, rainy day, just before Christmas, an old earthen dam holding back coal ash waste at the Tennessee Valley Authority’s Kingston Fossil plant erupted, pouring over one billion gallons of ash sludge into the Emory river and across 300 acres of neighboring property, uprooting trees and destroying two dozen homes in its path. The ash still isn’t completely gone, and TVA is still in the midst of a $1.2 billion cleanup, and liable for additional damages. 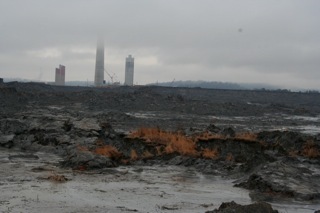 During short-term clean up, TVA dredged more than 3.5 million cubic yards of coal ash from the Clinch and Emory Rivers. The workers who helped clean up the ash from the Kingston spill are suing the contractor who worked for TVA – on account of significant respiratory illnesses. While many people were aware of the coal ash stored at the Kingston Plant, almost no one was prepared for the devastation that a waste pond failure like this could cause. Moreover, Kingston is just one plant in the Tennessee Valley Authority’s fleet of 11 coal plants and just one plant out of the regions’ approximately 80. At the time of the Kingston disaster, it was unclear how many more of these plants might have had the potential to cause as much devastation as Kingston. Neither EPA, regional advocates, nor most state agencies, had the information to answer these questions. In the years since the Kingston spill, there have been additional spills though none as dramatic as the Kingston disaster. You can learn more about these smaller spills on Earthjustice’s website. The spill has driven responses across the advocacy world to increase public education and access to information about the hazards of coal ash and now there is a great deal of public information about the dangers of coal ash. EPA has since conducted an analysis of the nation’s coal ash ponds to determine the hazard potential from a dam failure like Kingston’s. In the Southeast alone there are around 400 known coal ash storage facilities with a total capacity to hold over 118 billion gallons of ash. The Southeast is home to over 50 documented contamination sites where there is known pollution to the ground or surface water. There are also at least 20 “high hazard” coal ash dams in the Southeast as determined by the above-mentioned EPA assessment. These are dams whose failure would be highly likely to inflict loss of life and devastation to communities nearby. This number reminds us how lucky we are that the Kingston disaster happened in the middle of the night in the middle of the winter, rather than on a sunny day when boaters, anglers and swimmers were out on the Emory River.